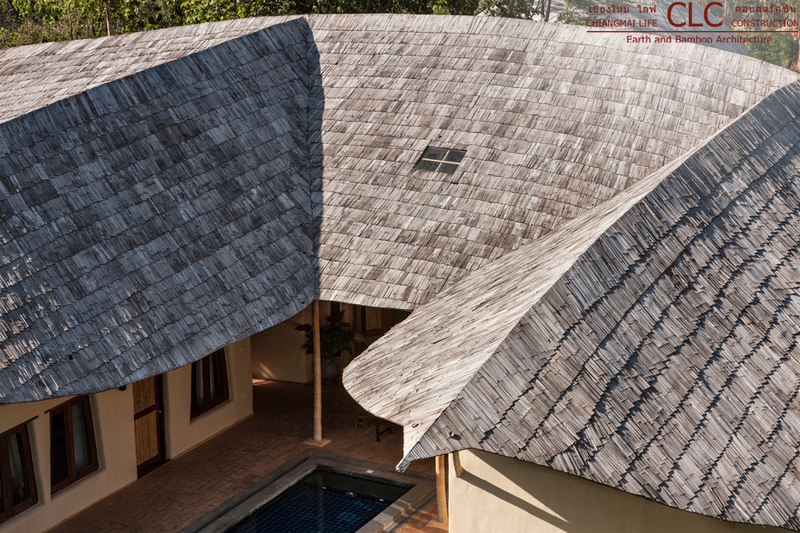 Trika Villa, a 425 sqm luxury residence with 5-bedrooms and 5 bathrooms is a prime example of modern earth and bamboo architecture. 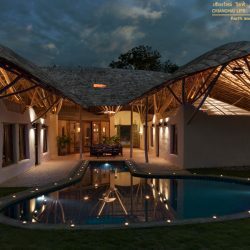 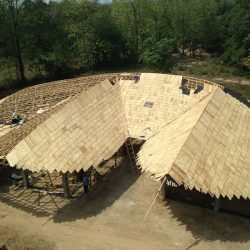 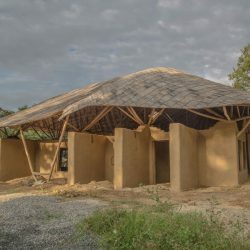 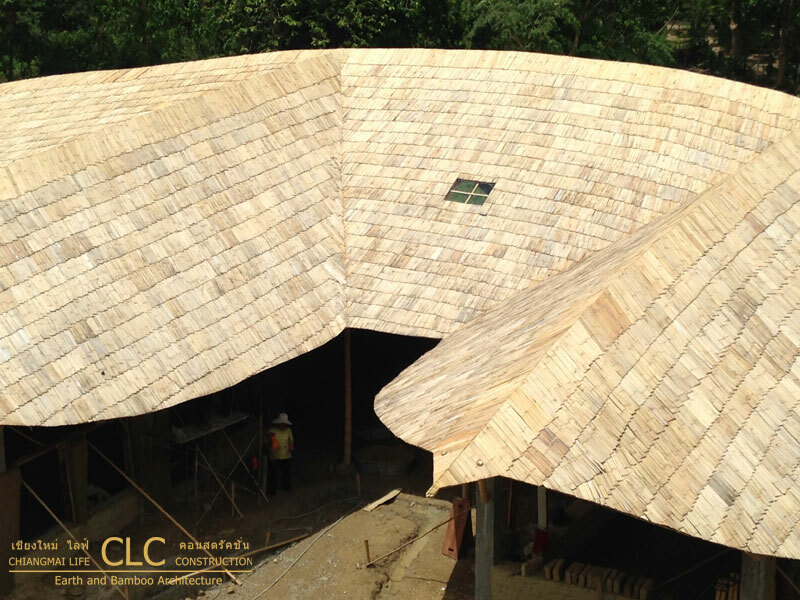 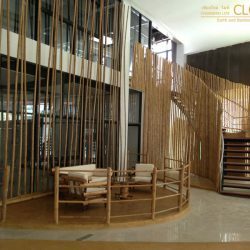 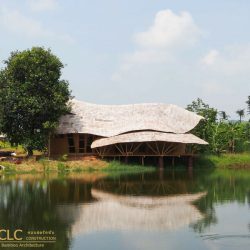 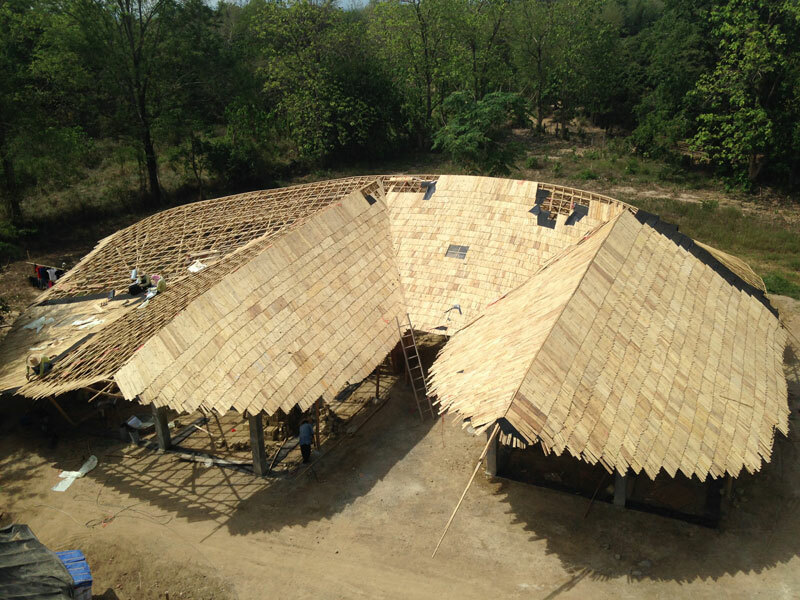 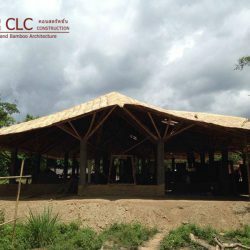 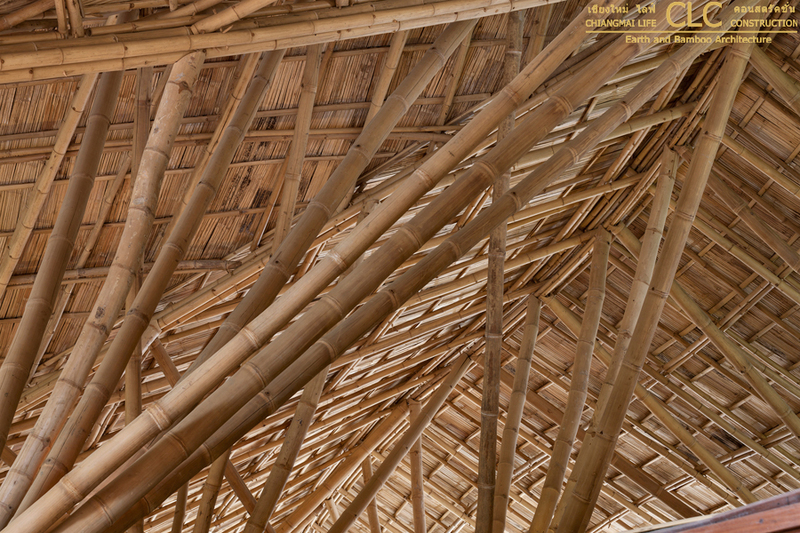 A big bamboo roof is hovering above the whole mansion like an umbrella, protecting it against sunshine and rain, but not sealing off the rooms, creating open, naturally ventilated spaces that are still connected to the outside. 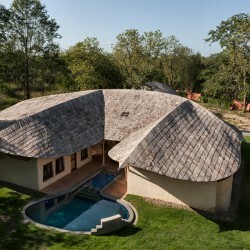 A central swimming pool is surrounded in a U shape by 3 bedrooms on one side, an open air living room on the small side and the master bedroom on the other side. 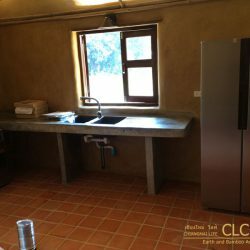 A living/dining room is adjacent to the big kitchen, attached to which are the maid quarters and back of the house areas. 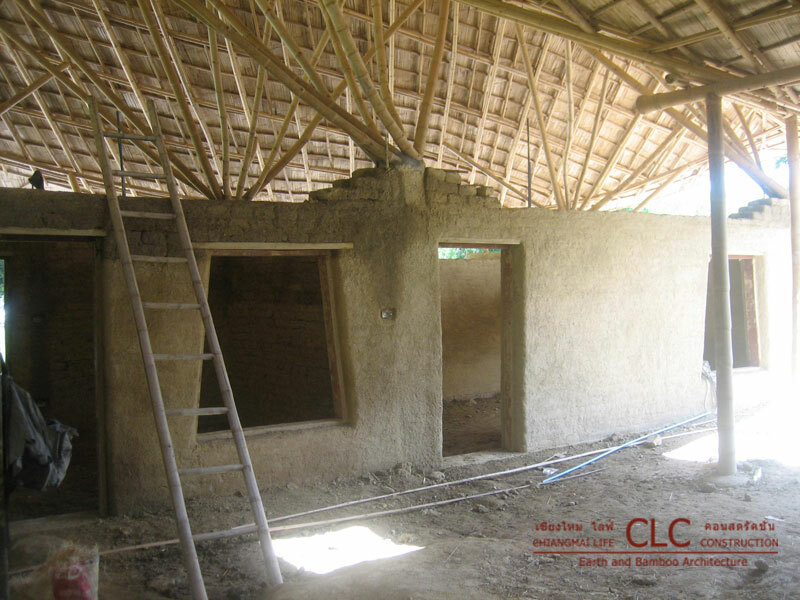 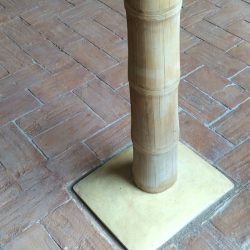 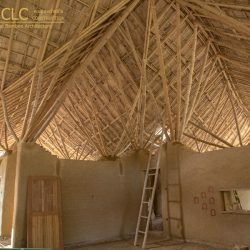 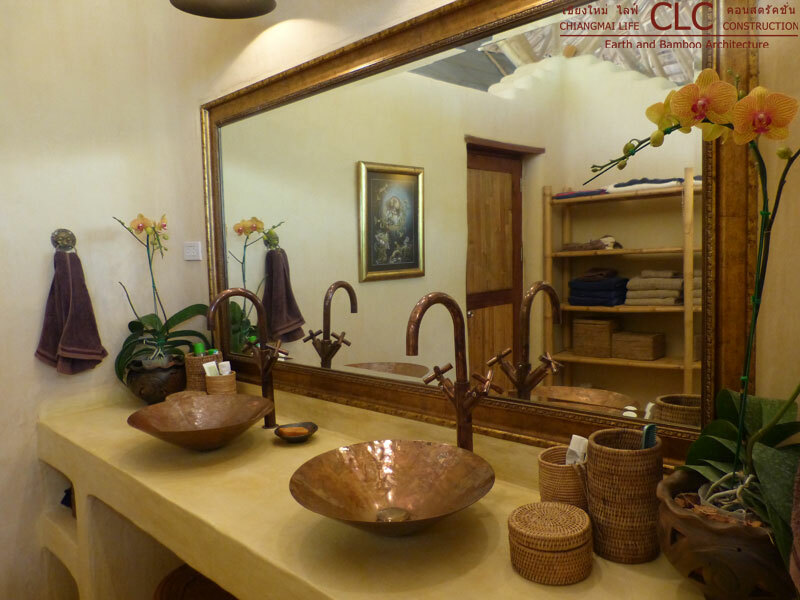 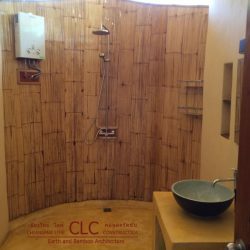 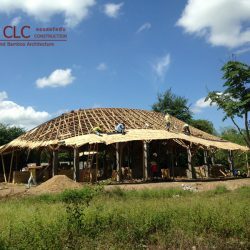 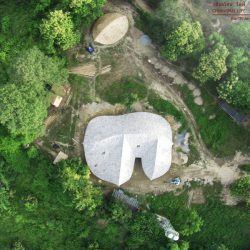 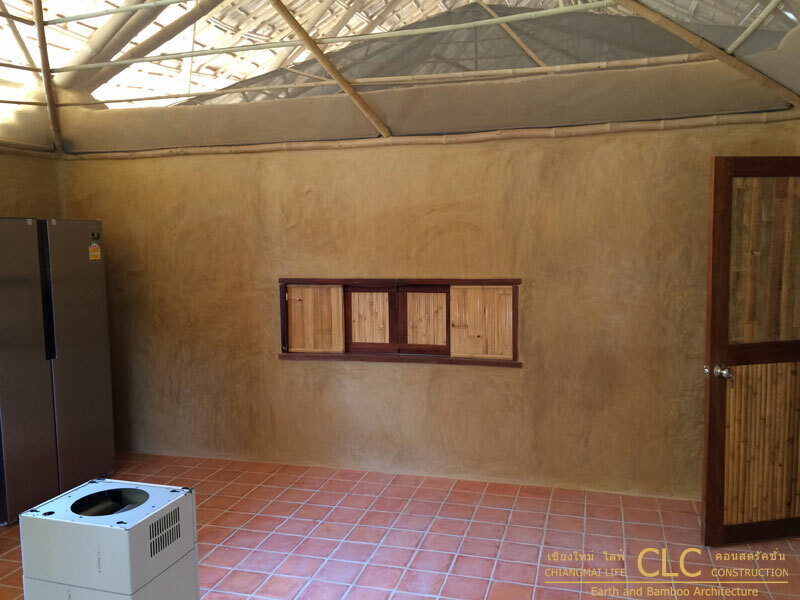 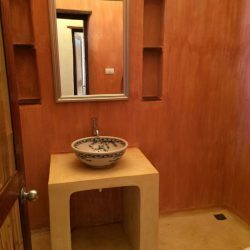 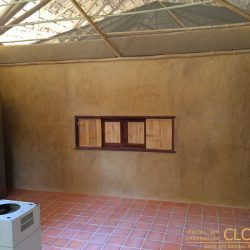 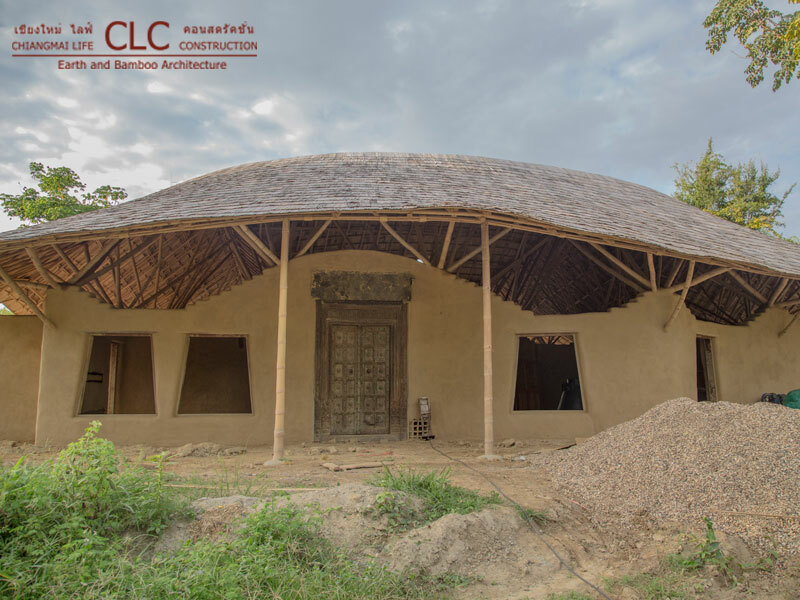 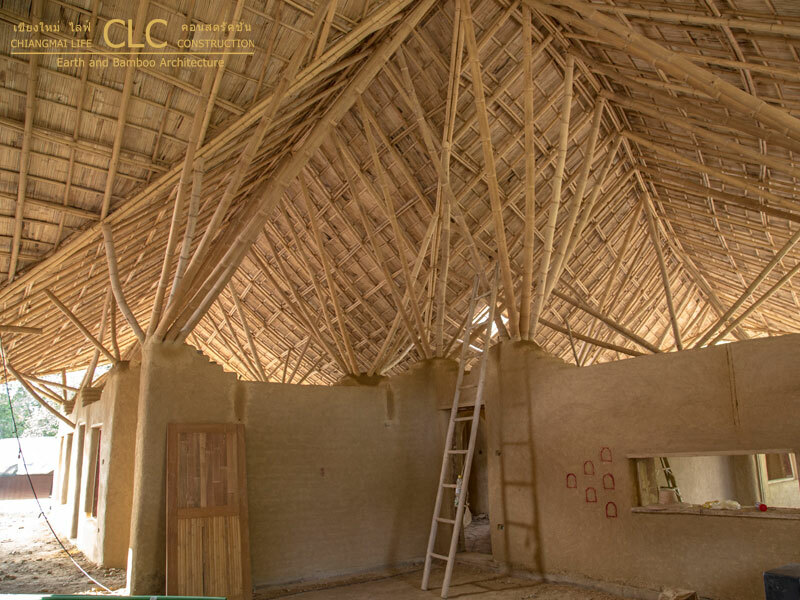 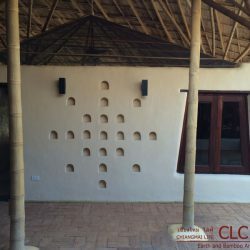 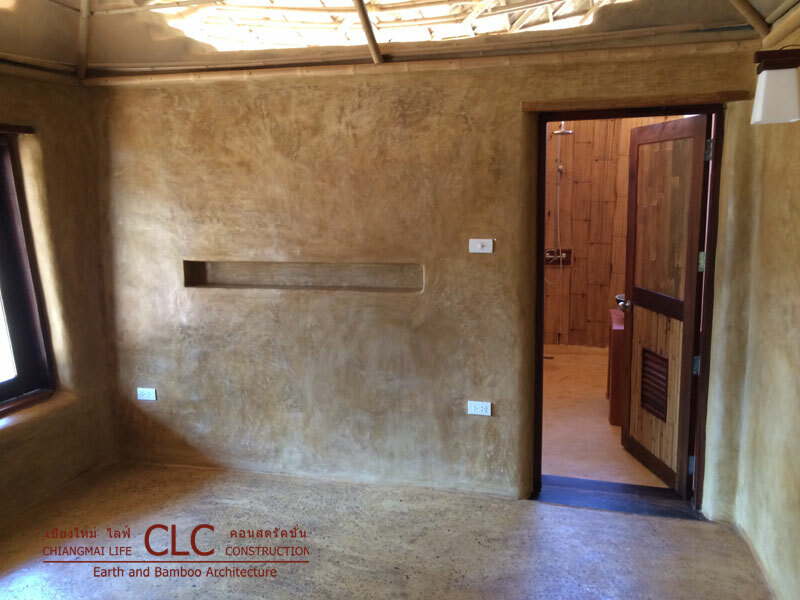 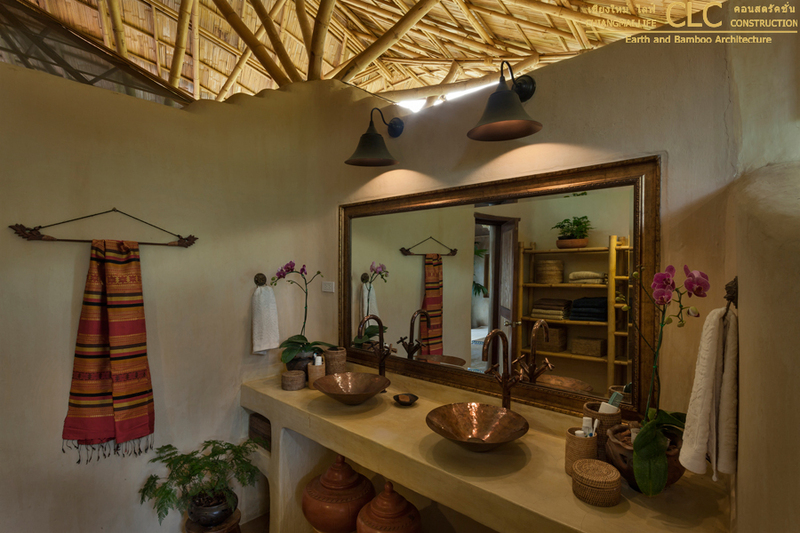 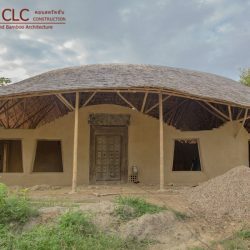 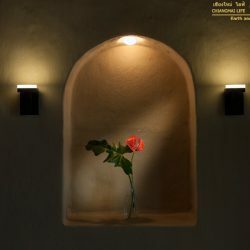 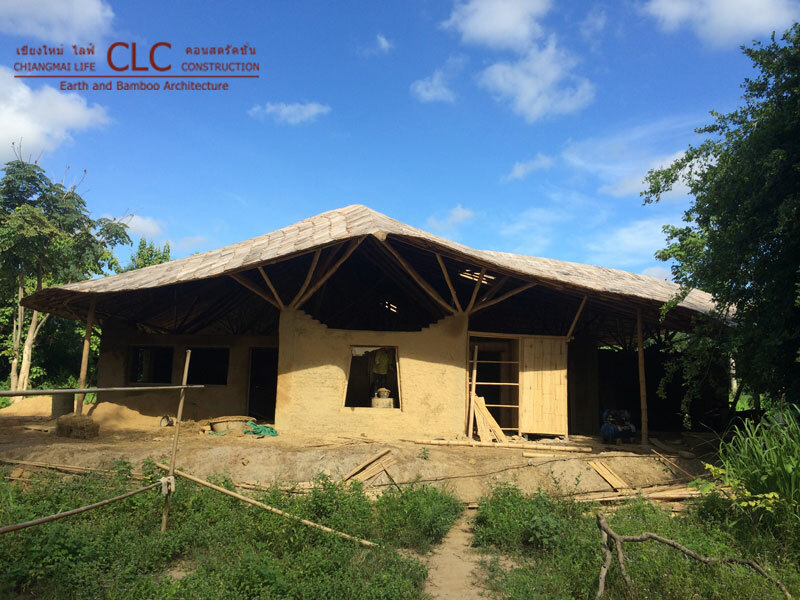 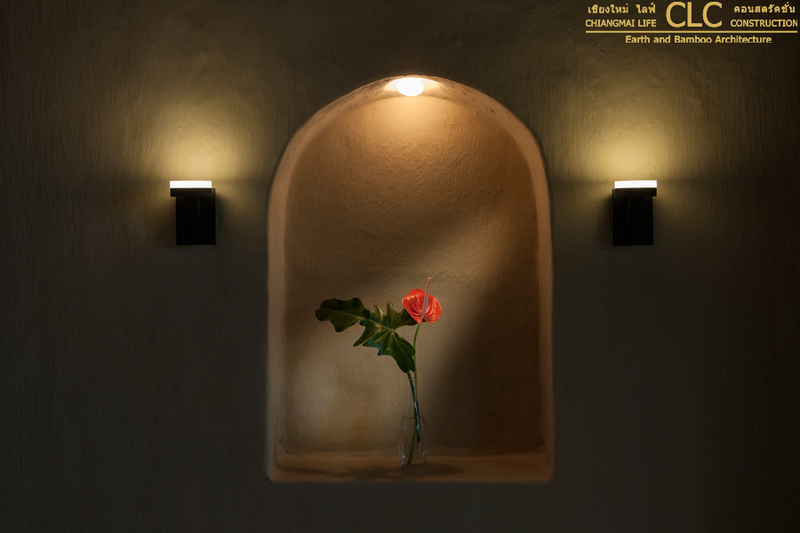 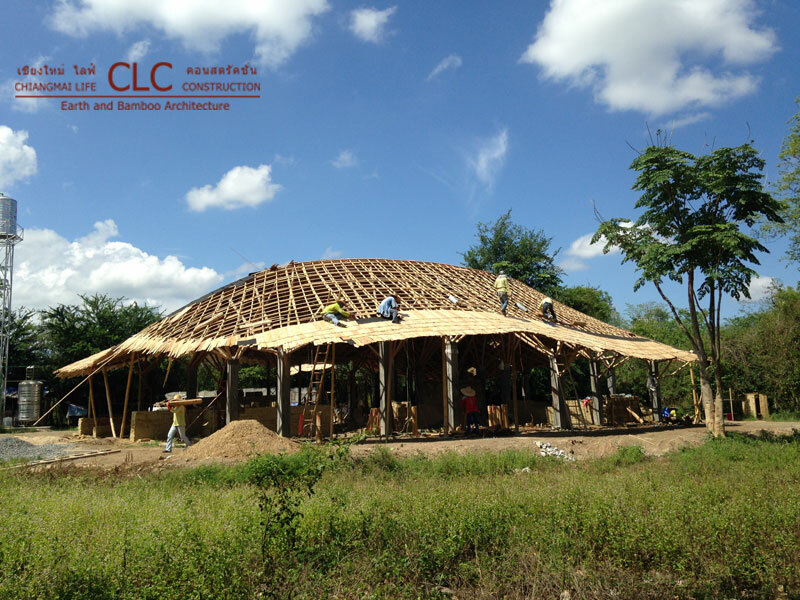 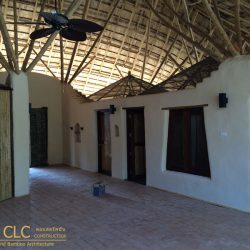 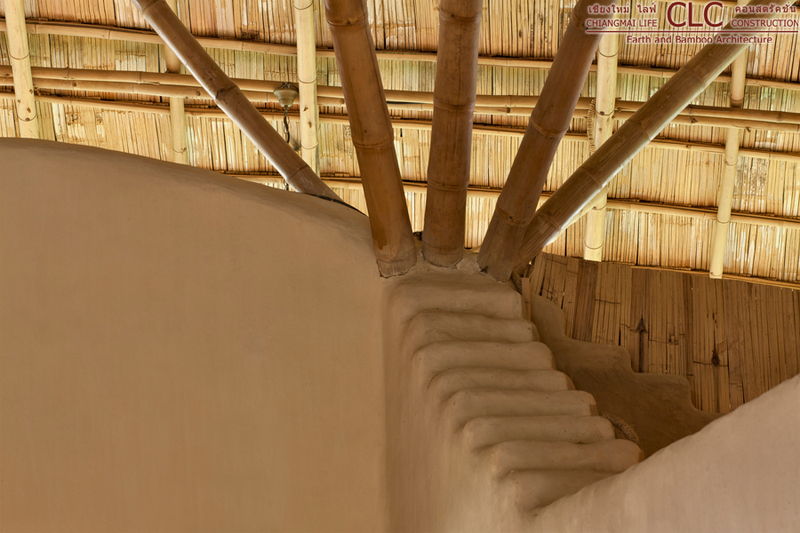 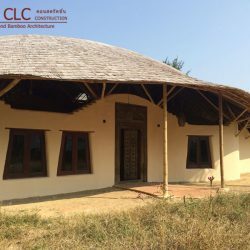 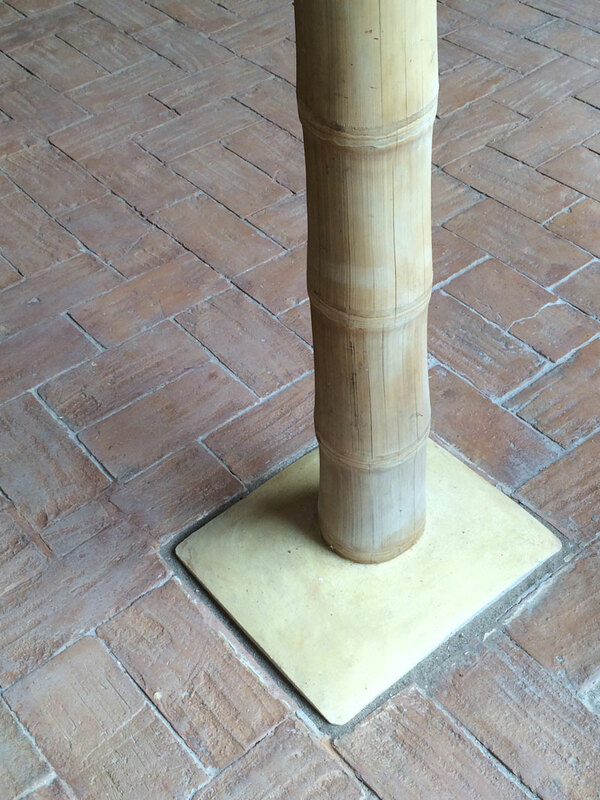 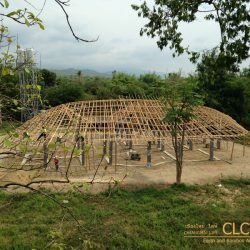 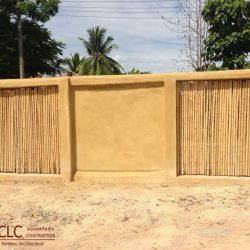 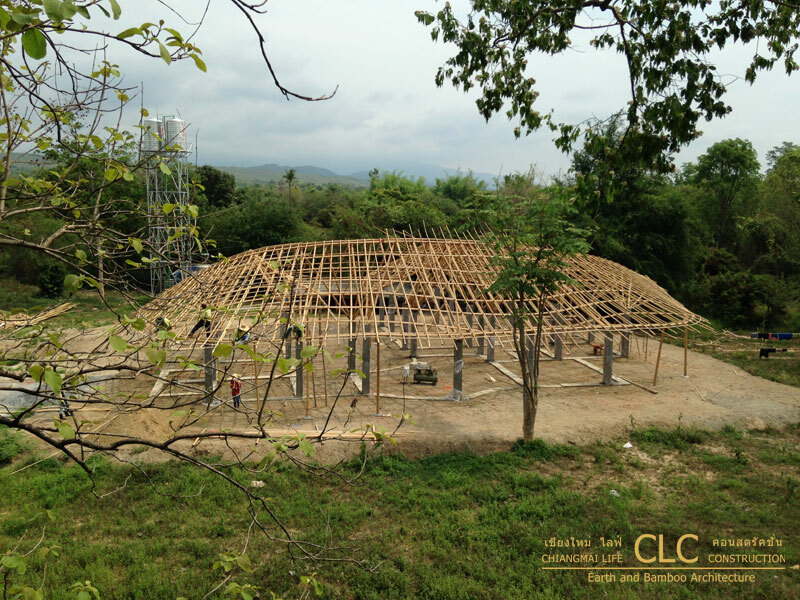 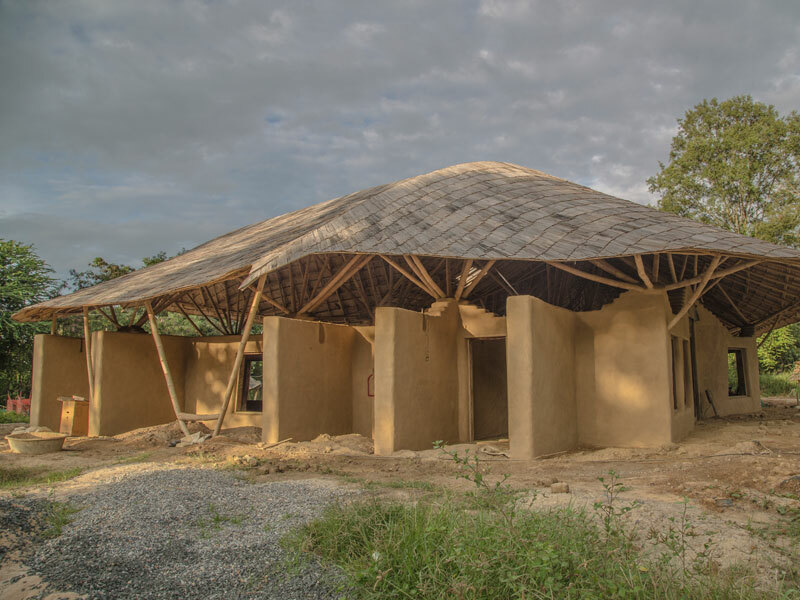 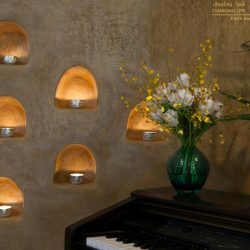 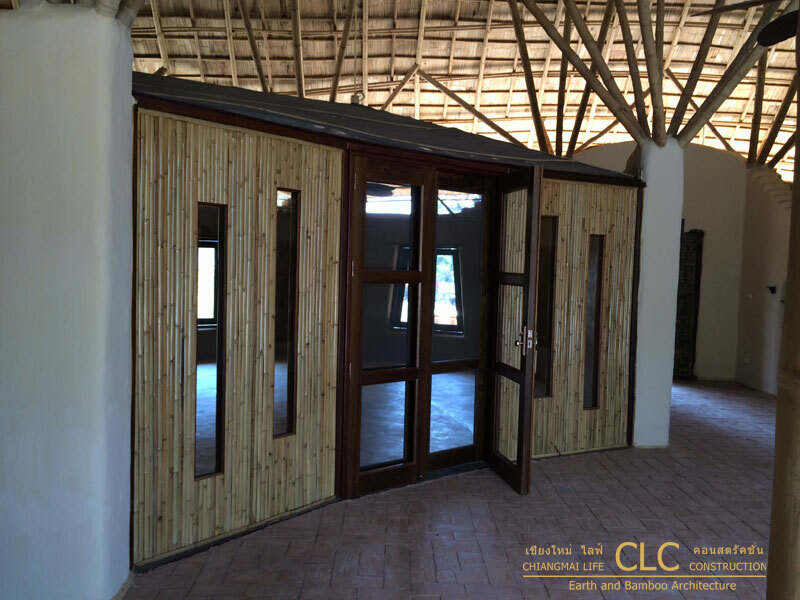 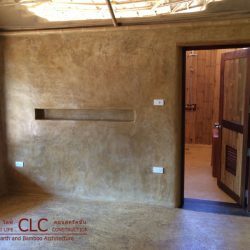 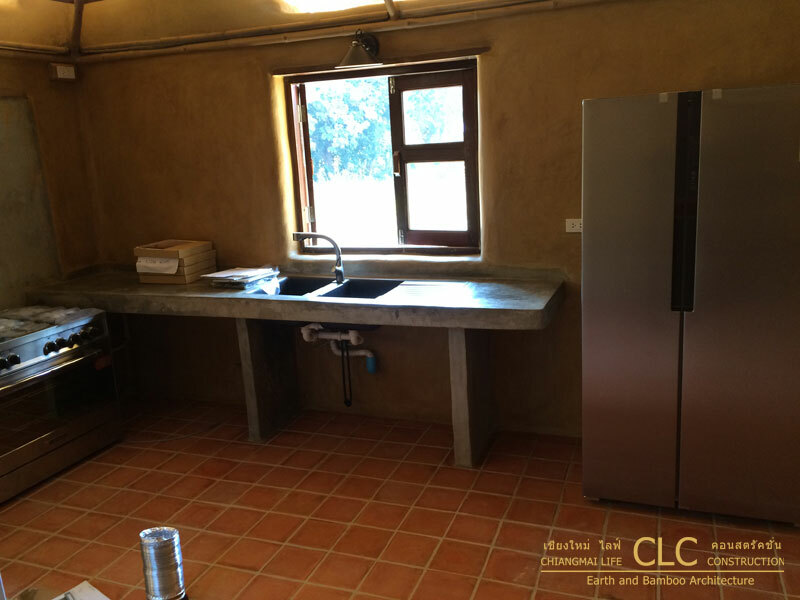 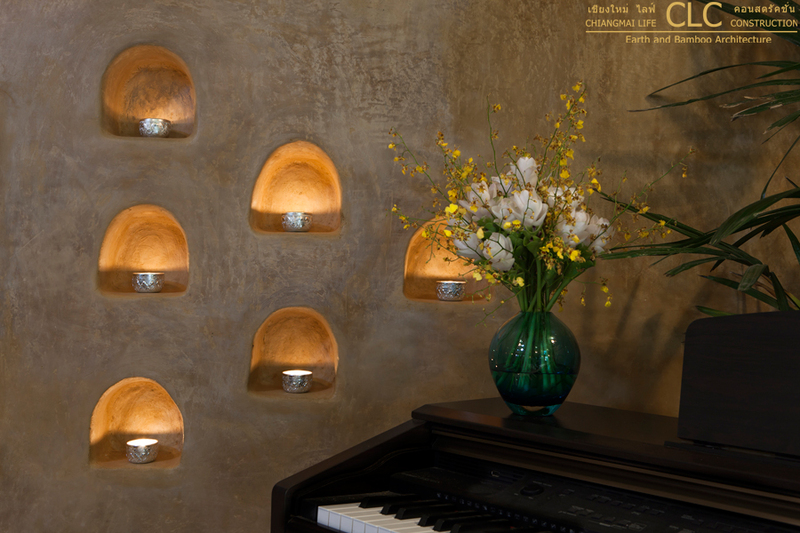 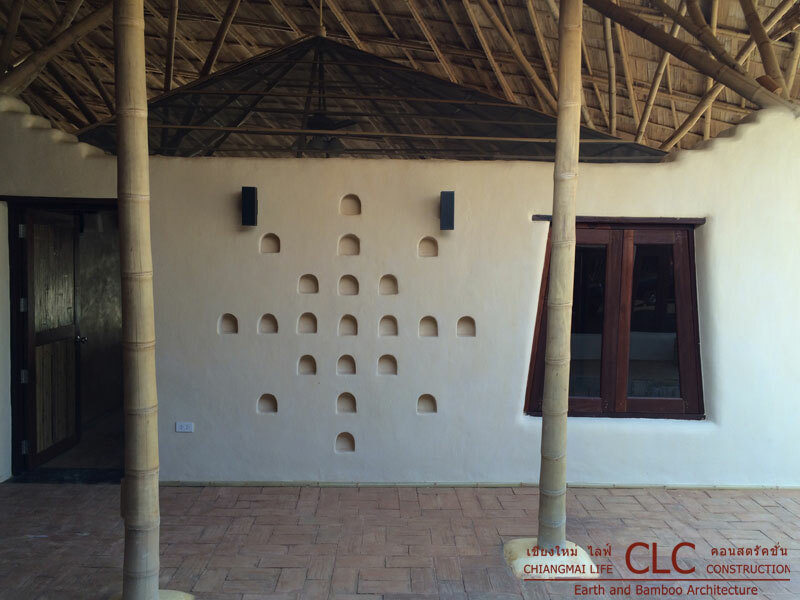 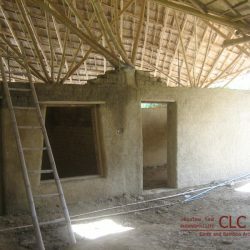 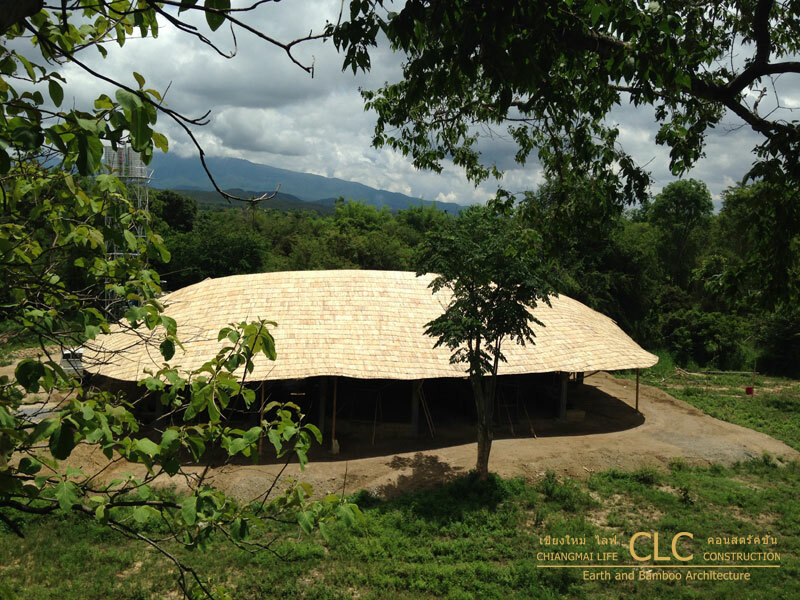 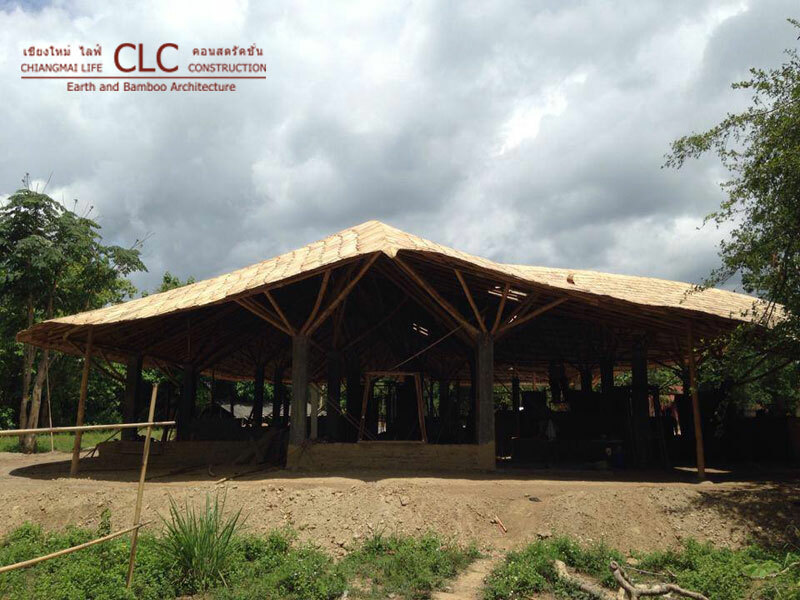 All walls are made of Adobe bricks and the floors of rammed earth or a clay-concrete mix. 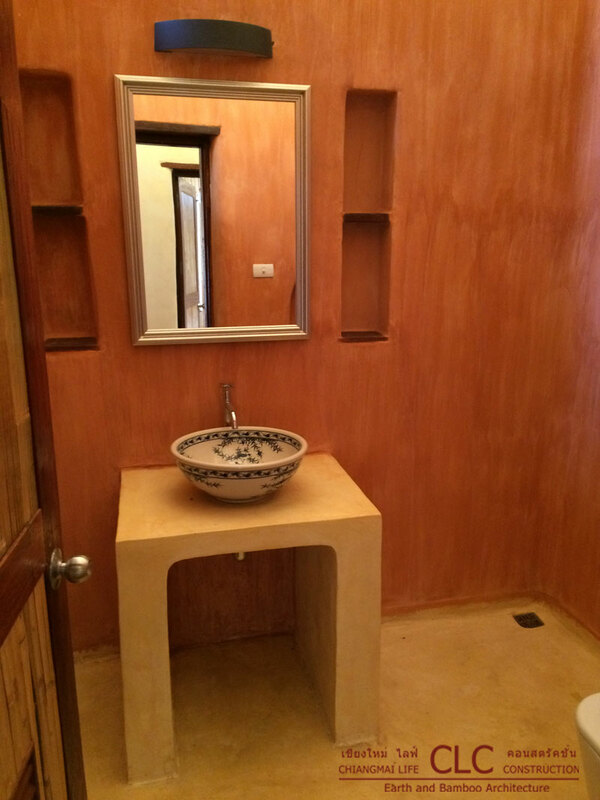 An antique Indian door built into the adobe walls gives Trika Villa its oriental touch. 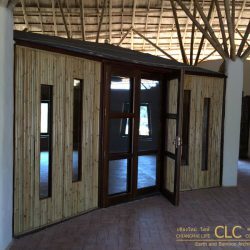 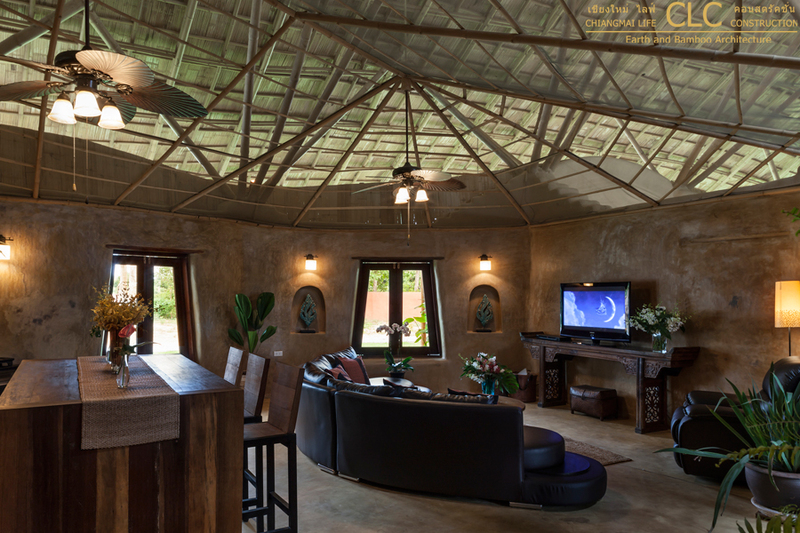 The individual rooms are cooled by the outdoor breeze and don’t need air-conditioning. 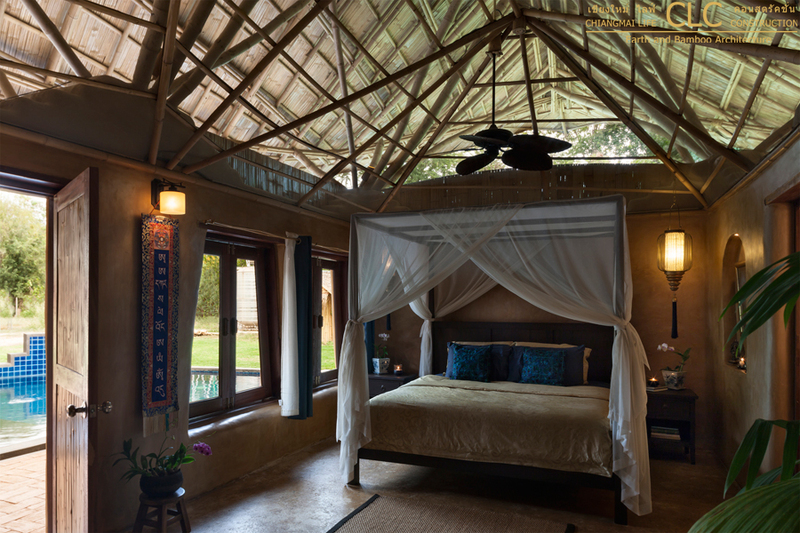 Instead of the ceiling, every room has a mosquito net tent cover to allow free roaming in the rooms without getting bothered by insects. 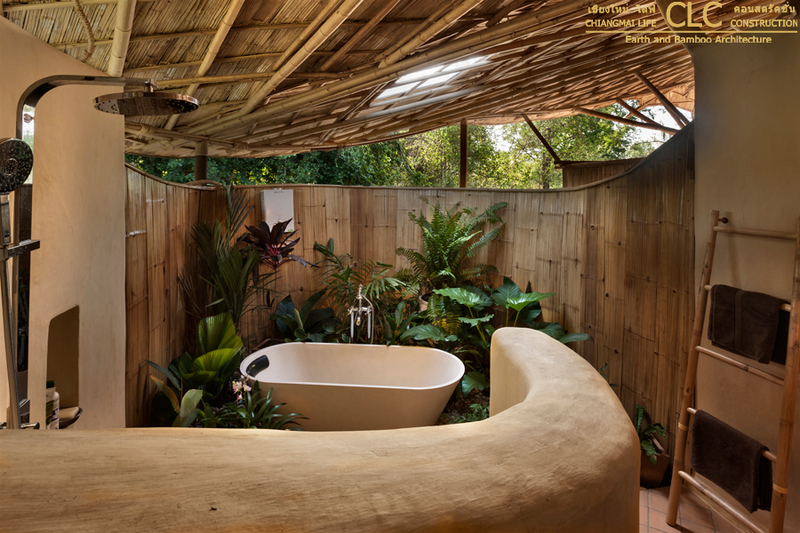 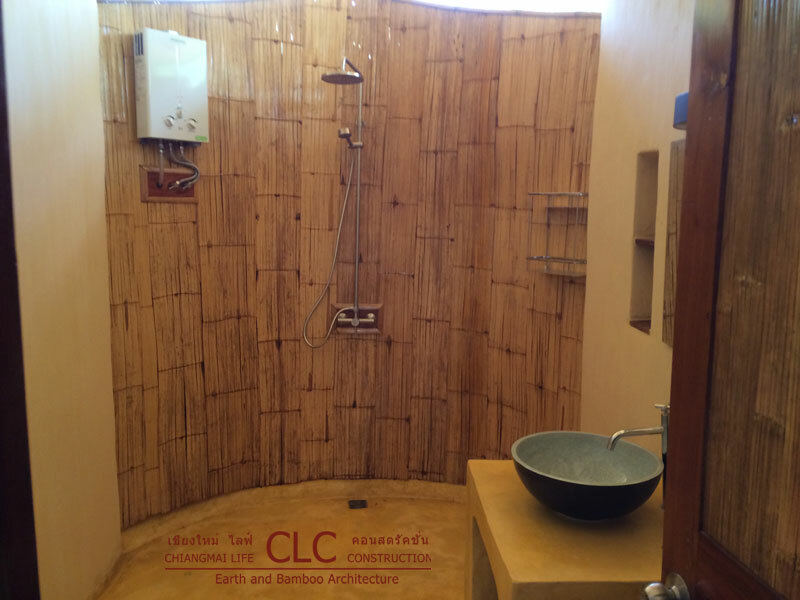 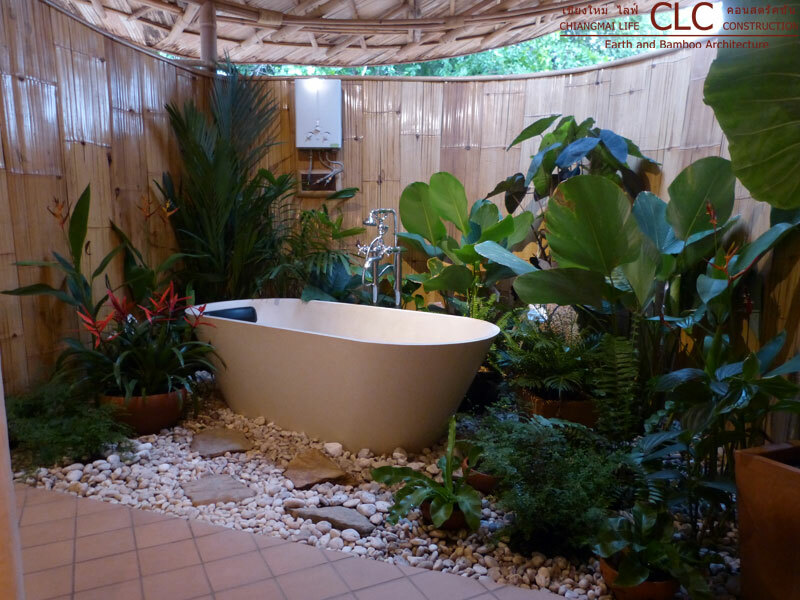 Each room has its own half open bathroom – the sink and toilet are under the roof, the shower is under the open sky. 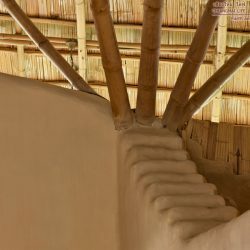 At Trika Villa the inside and outside are always connected. 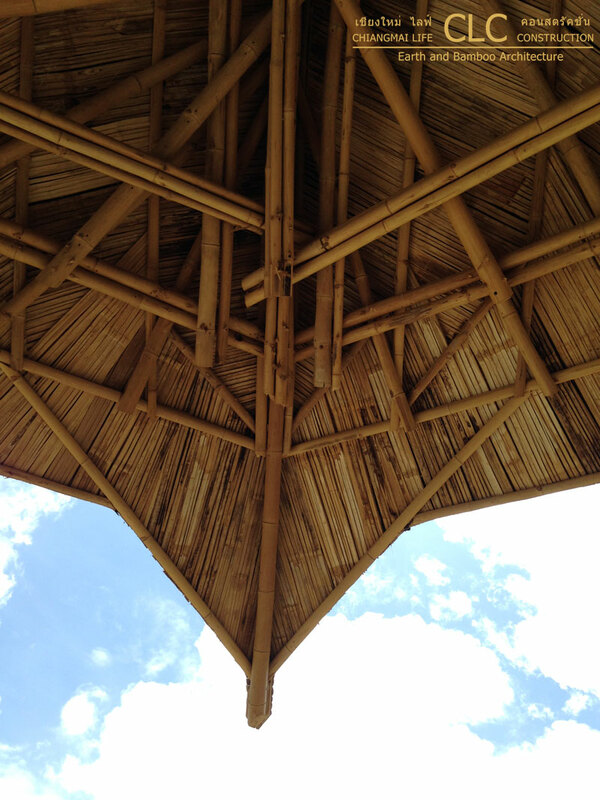 Thus nature automatically becomes part of life. 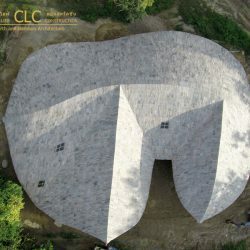 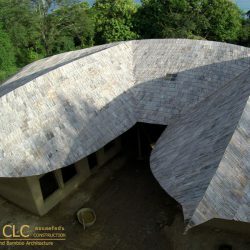 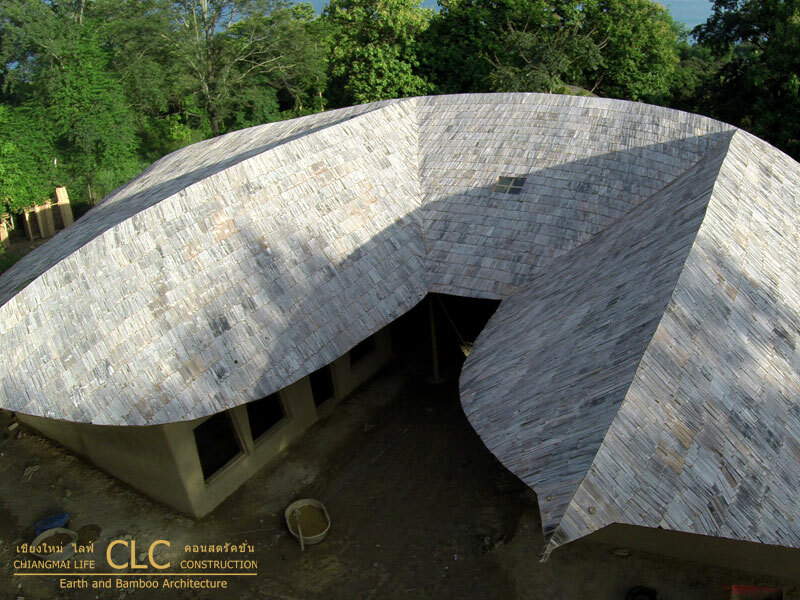 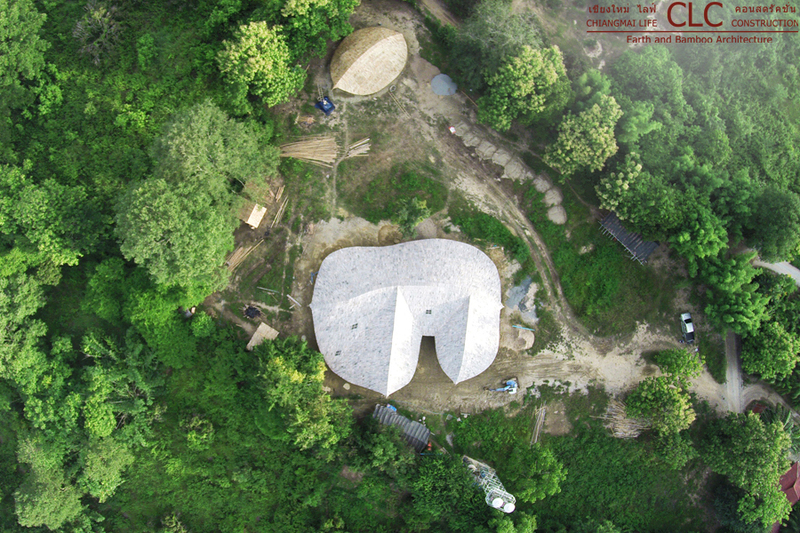 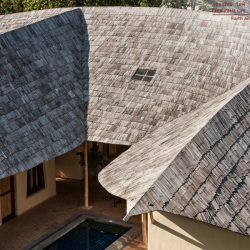 And of course by using mainly natural materials we have reduced the carbon footprint of this mansion to a comparable steel/concrete version by about 90 percent without having to forego a modern and luxurious lifestyle. 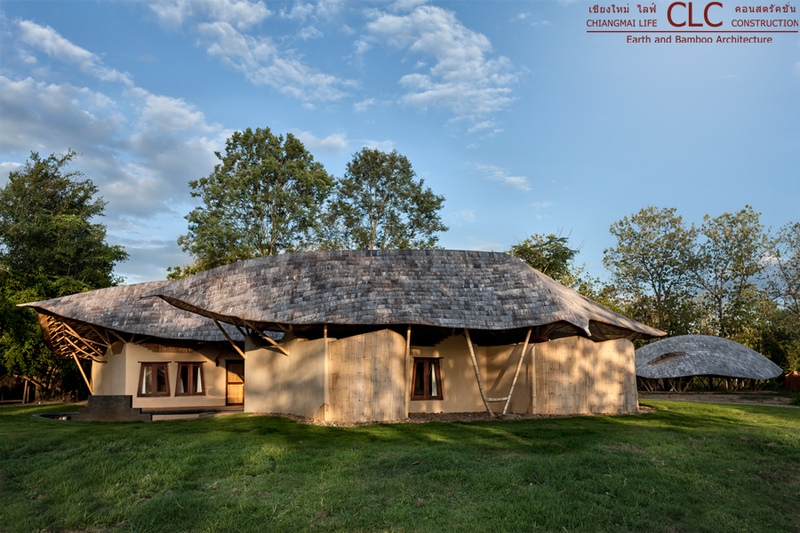 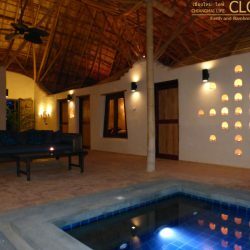 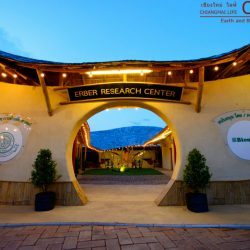 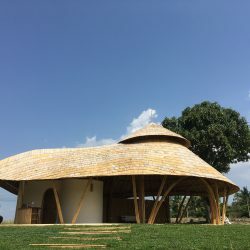 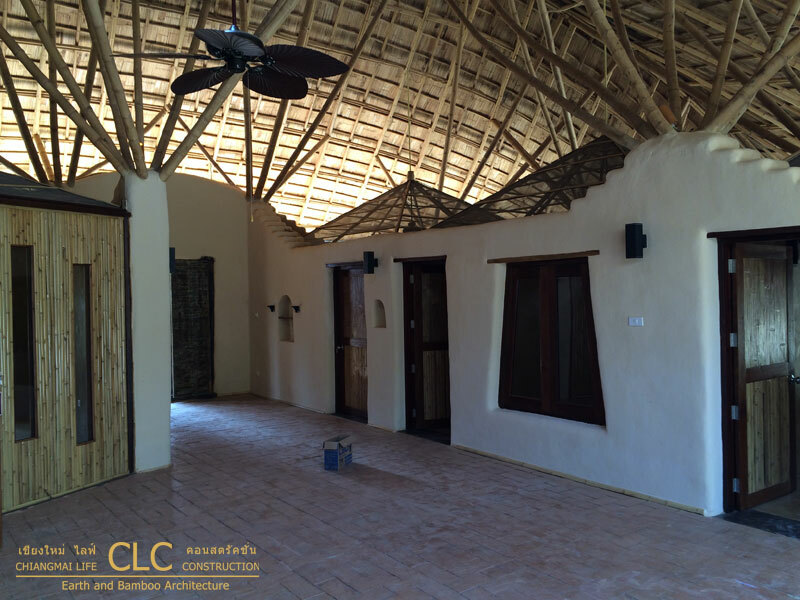 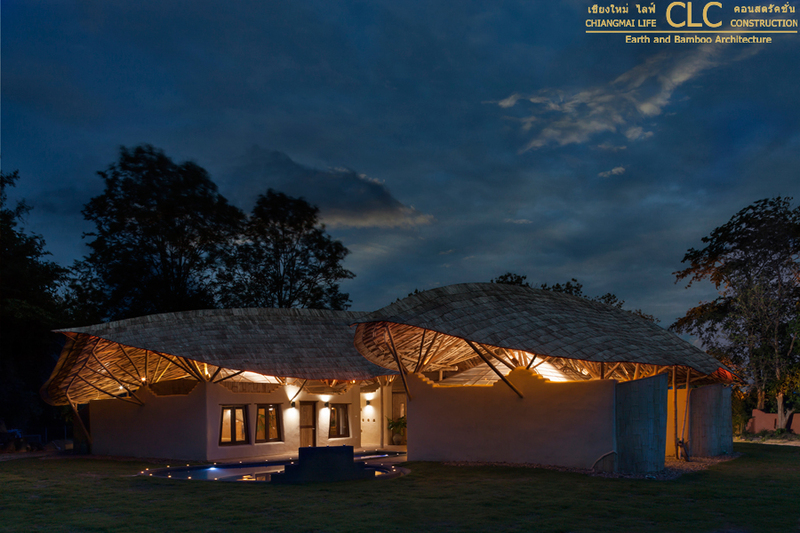 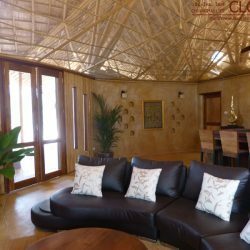 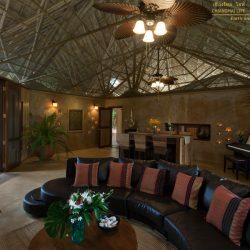 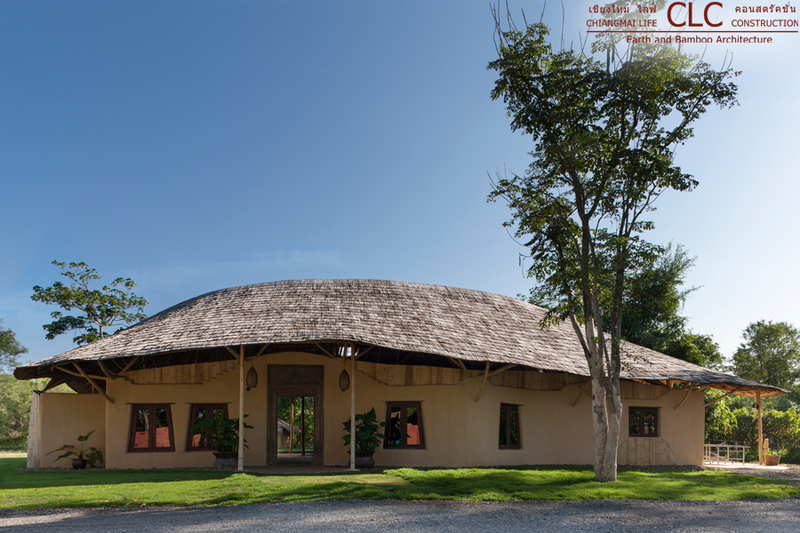 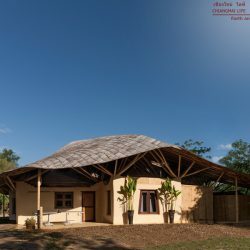 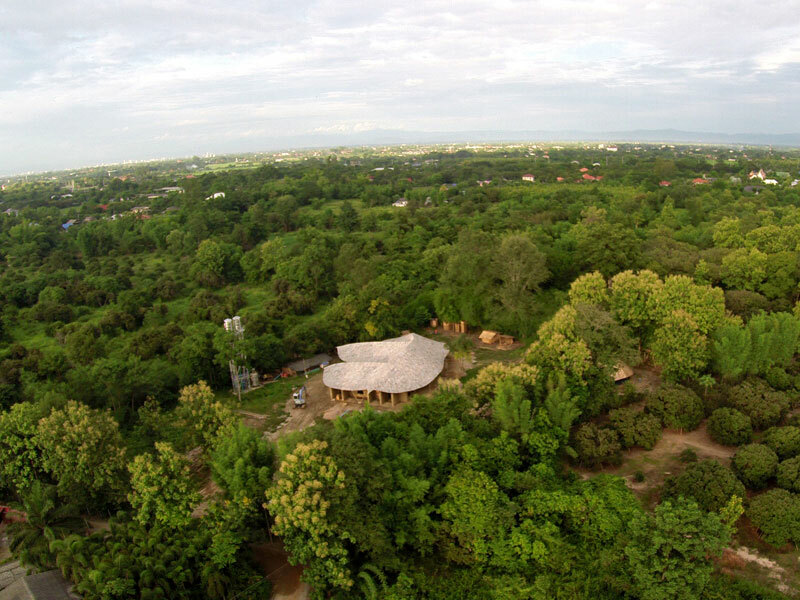 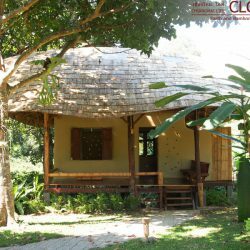 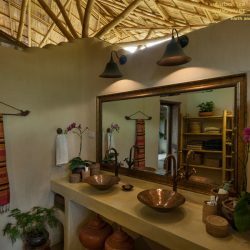 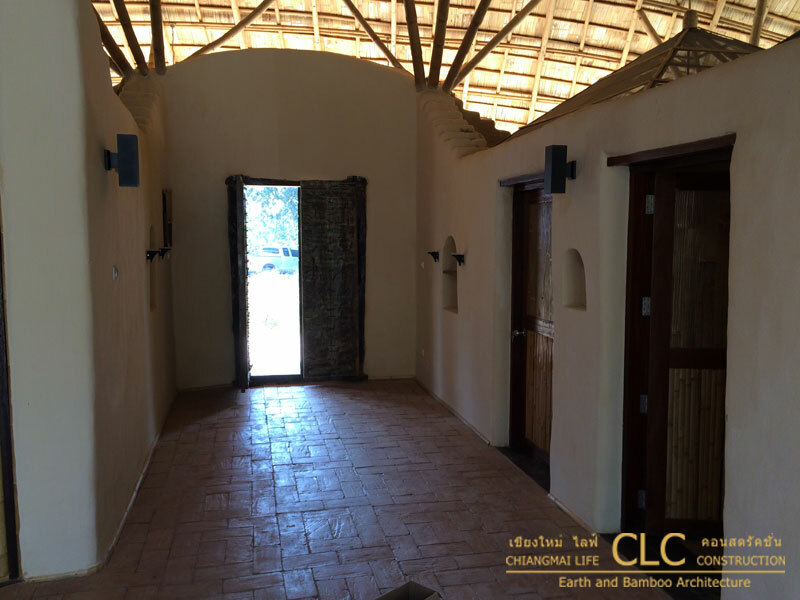 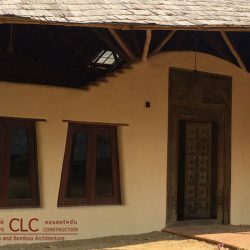 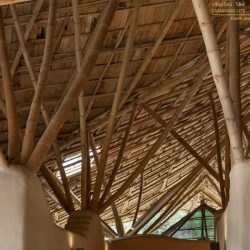 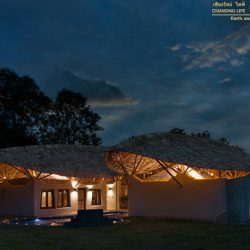 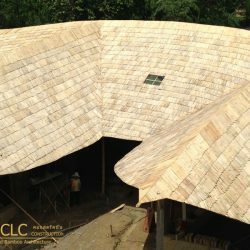 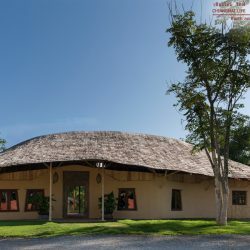 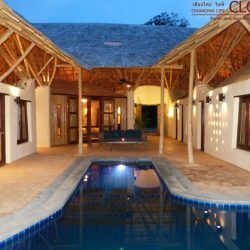 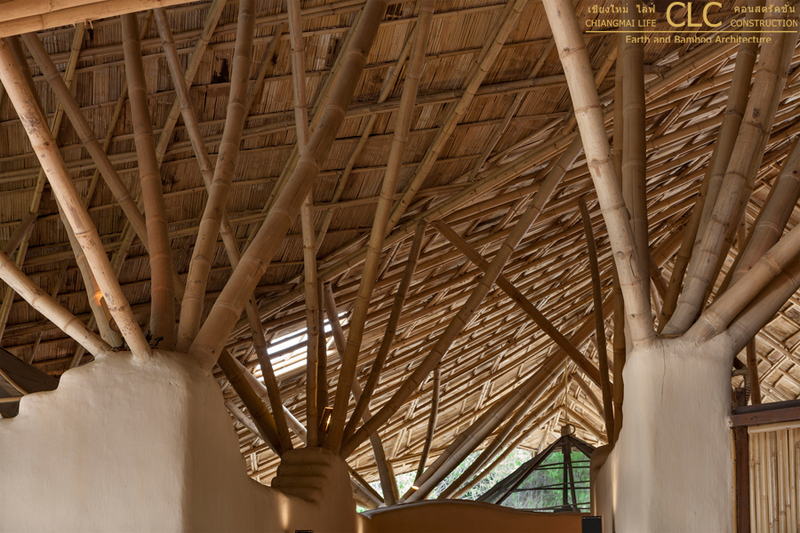 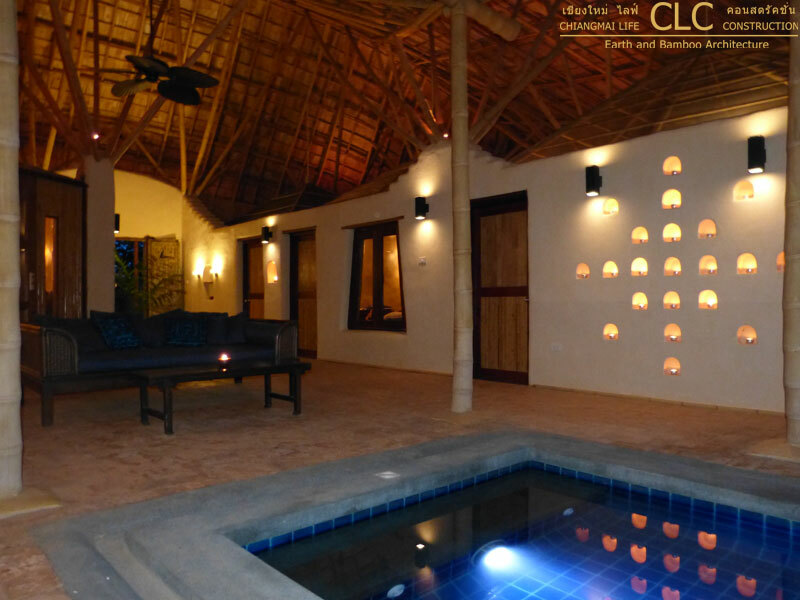 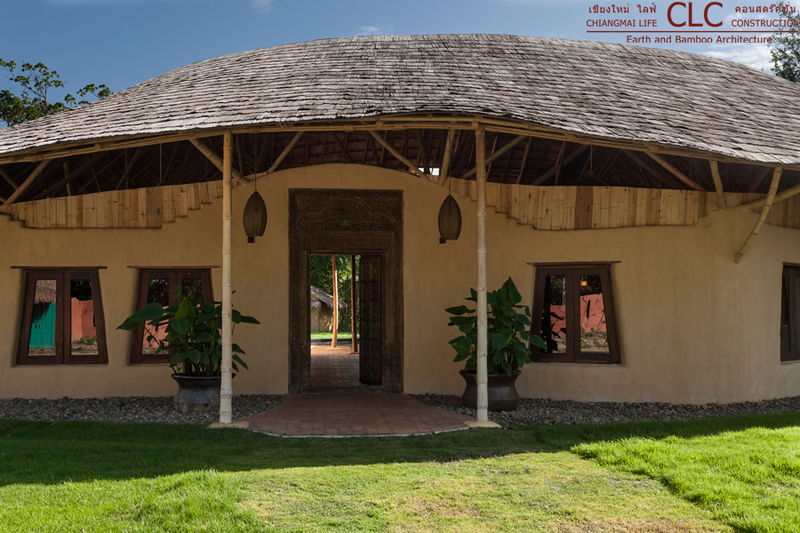 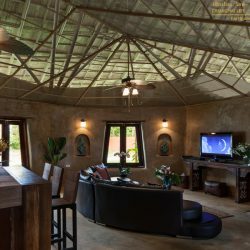 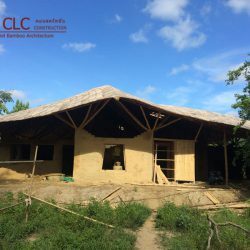 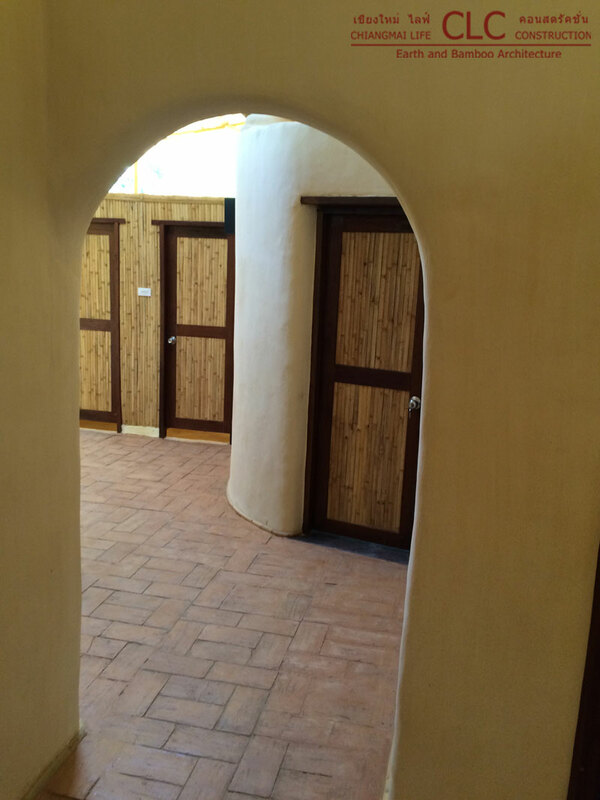 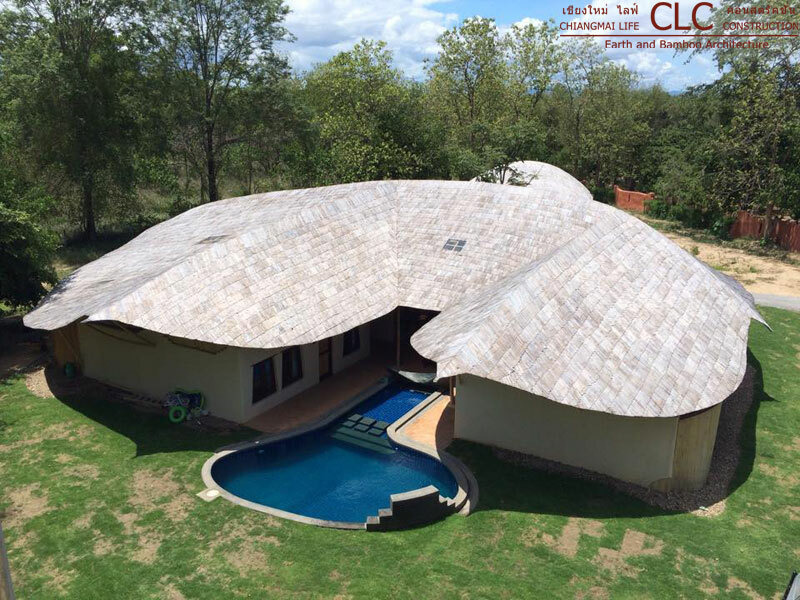 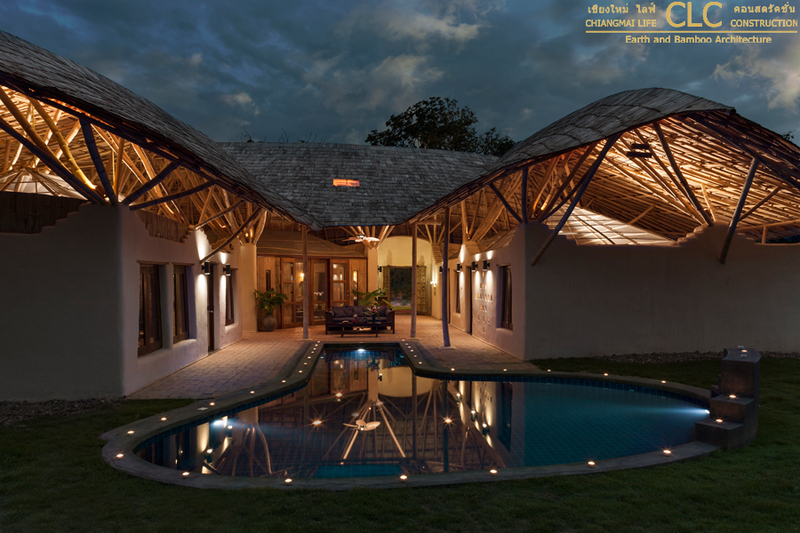 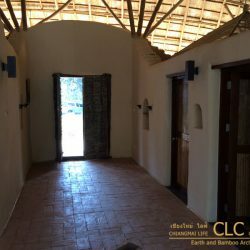 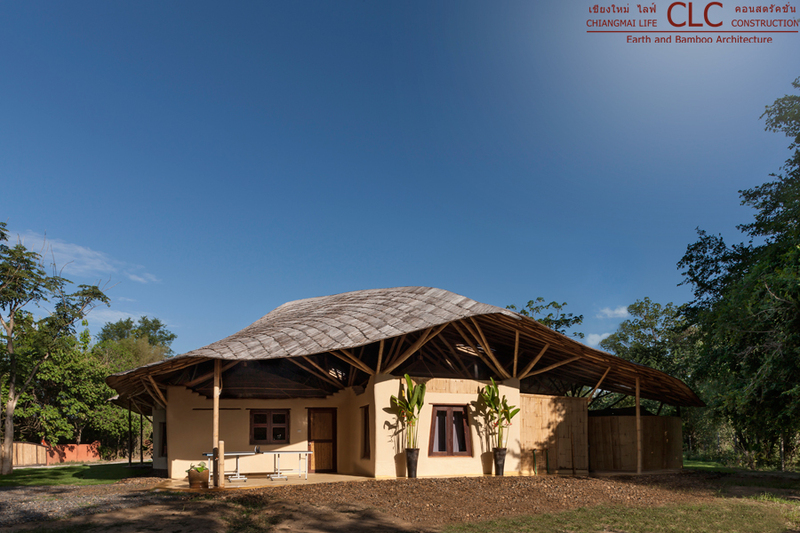 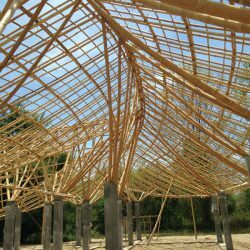 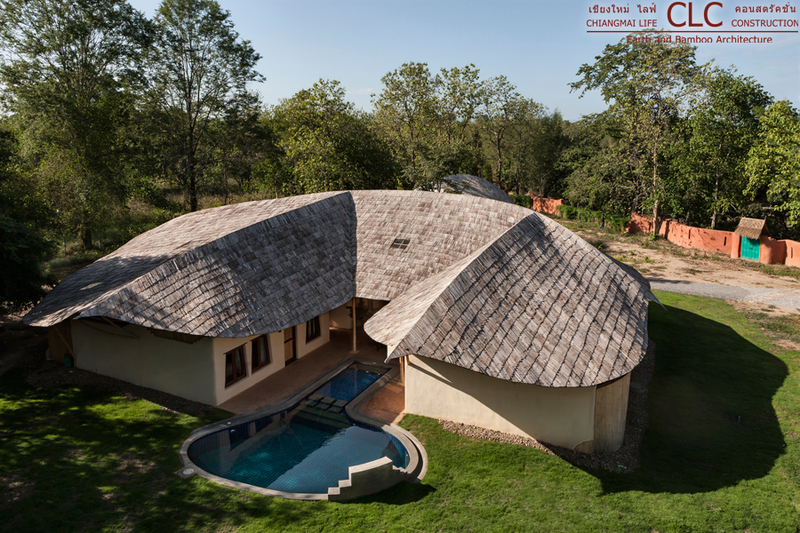 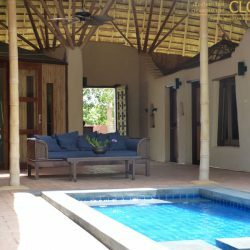 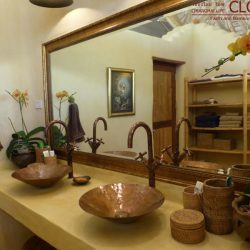 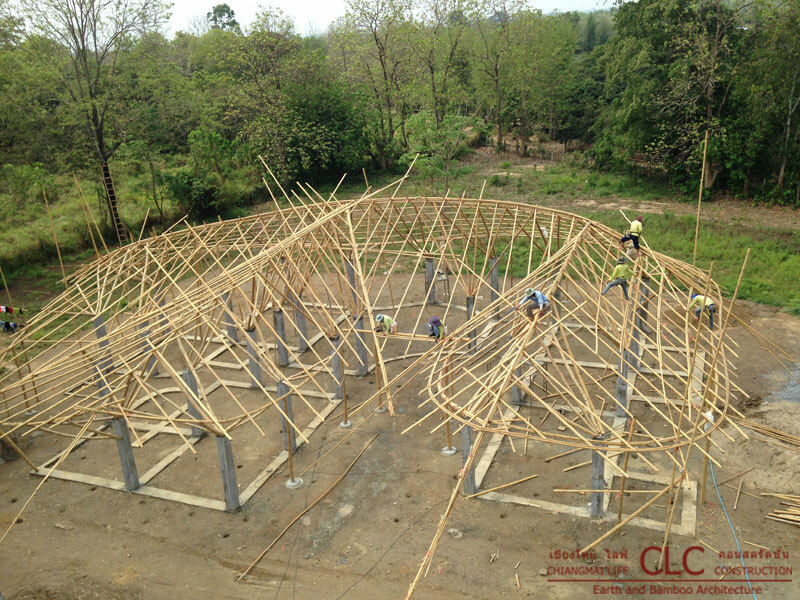 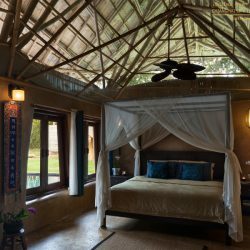 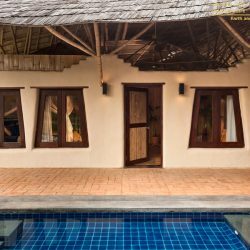 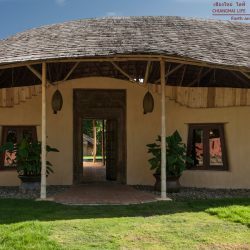 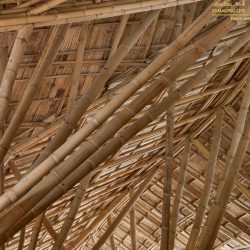 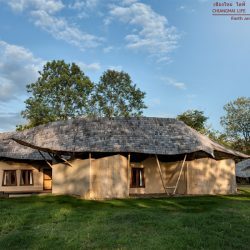 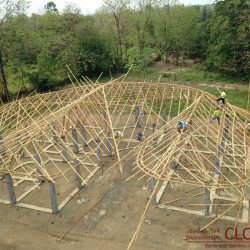 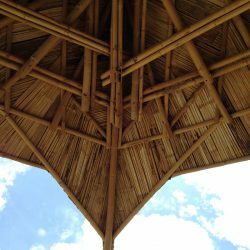 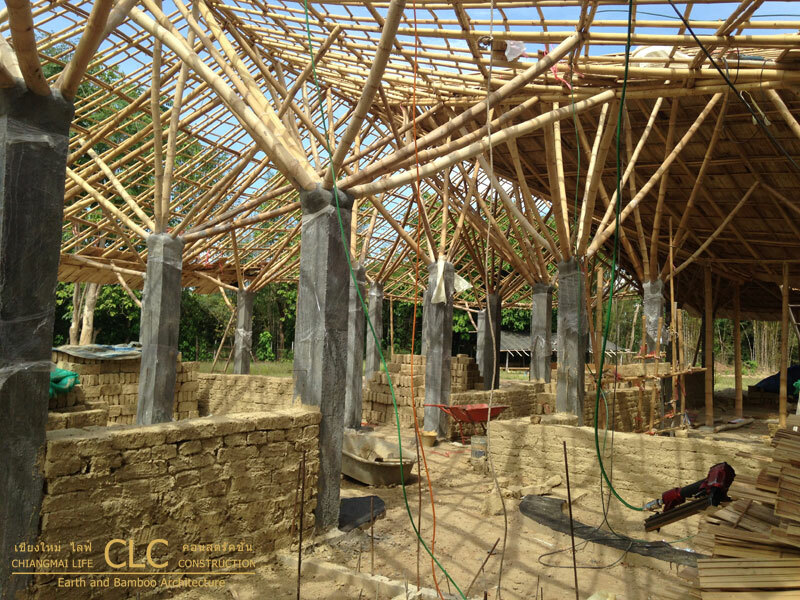 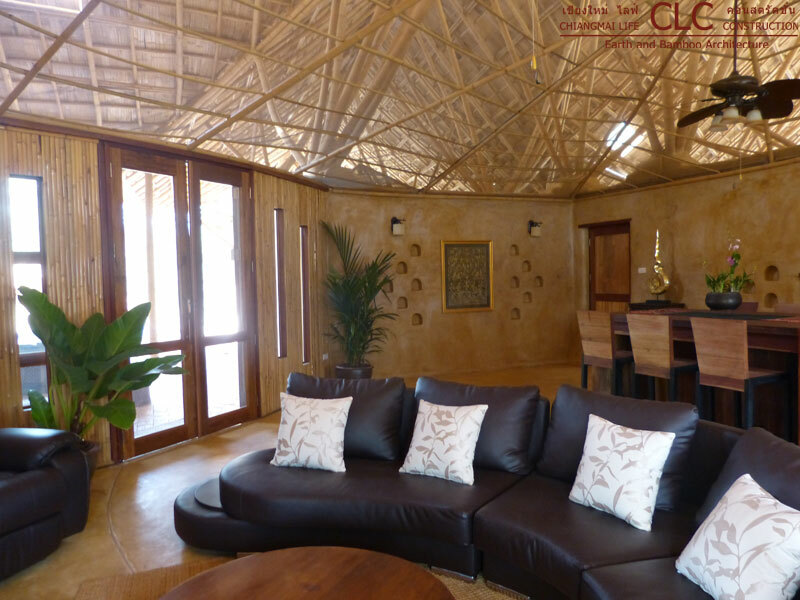 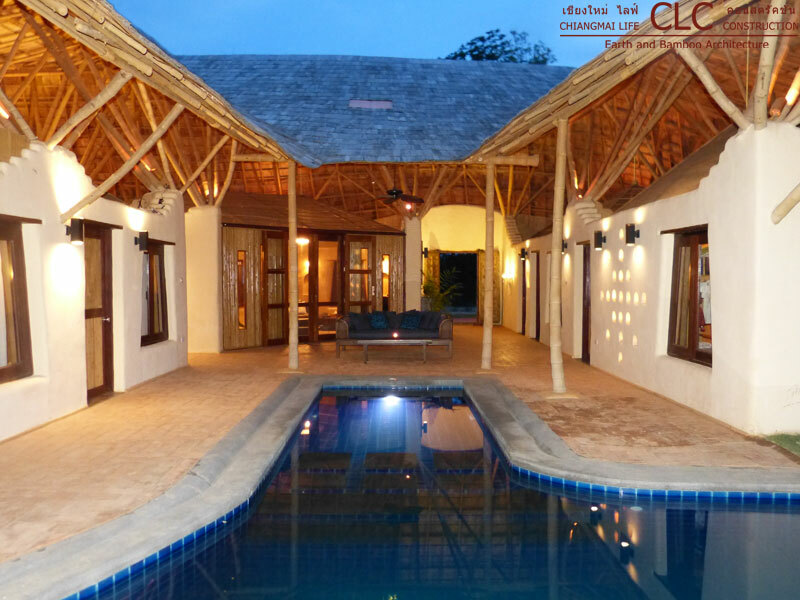 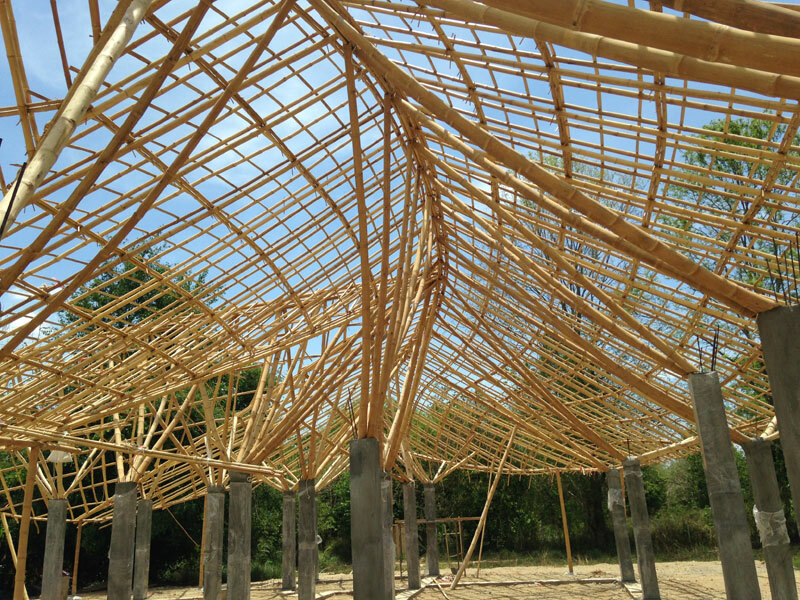 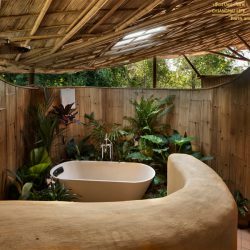 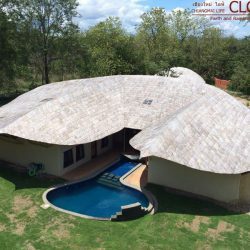 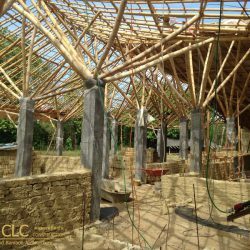 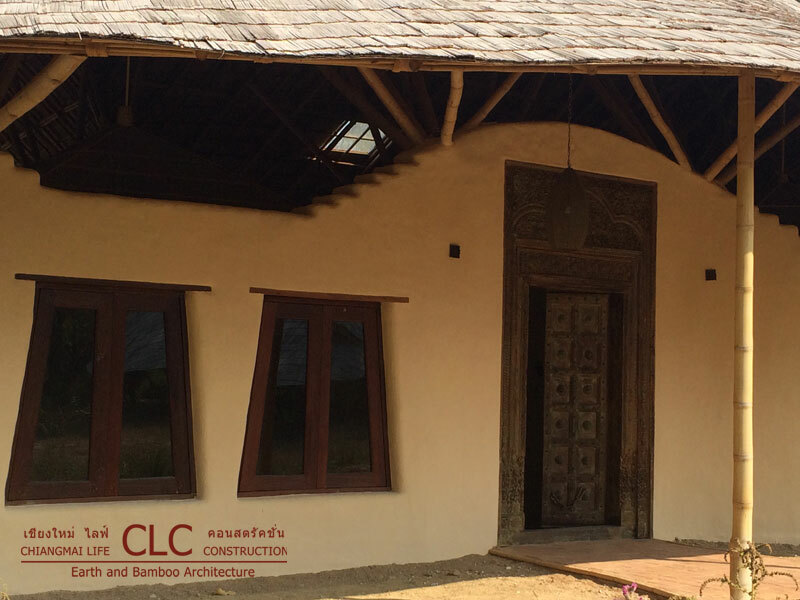 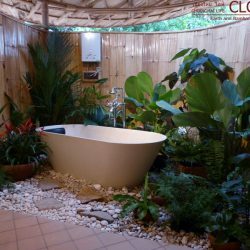 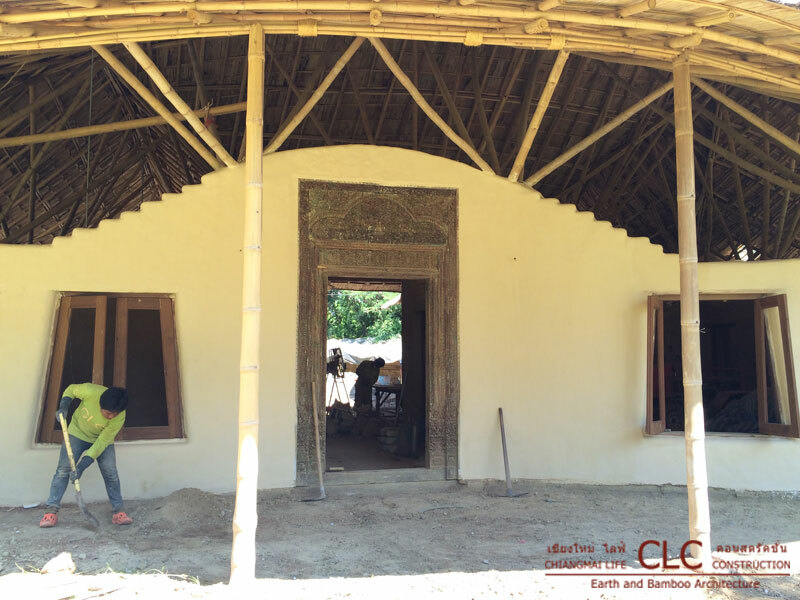 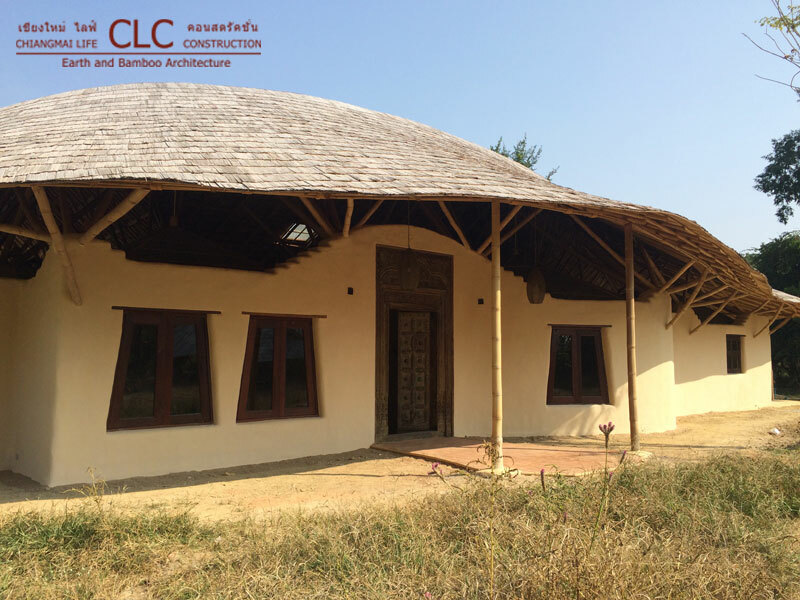 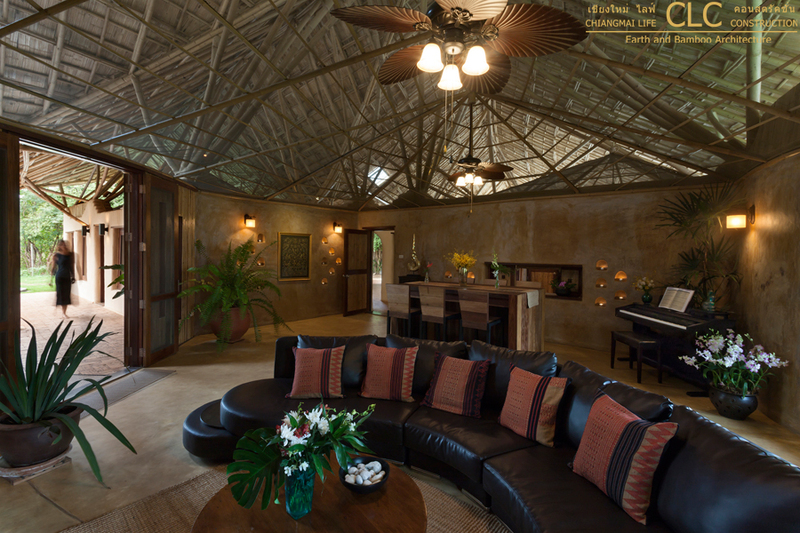 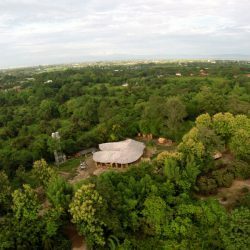 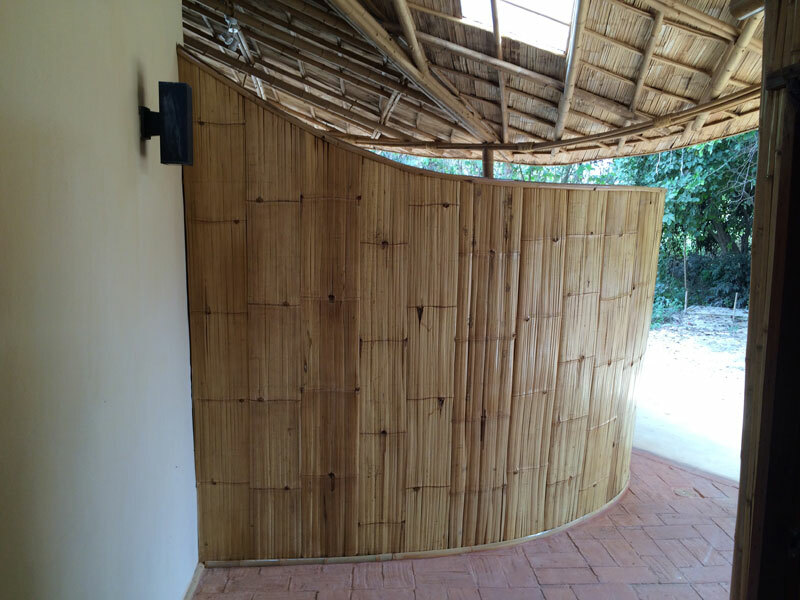 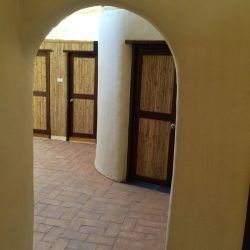 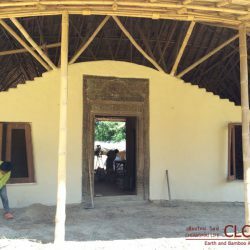 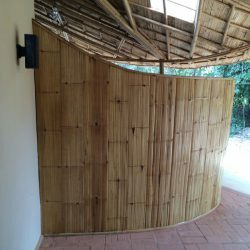 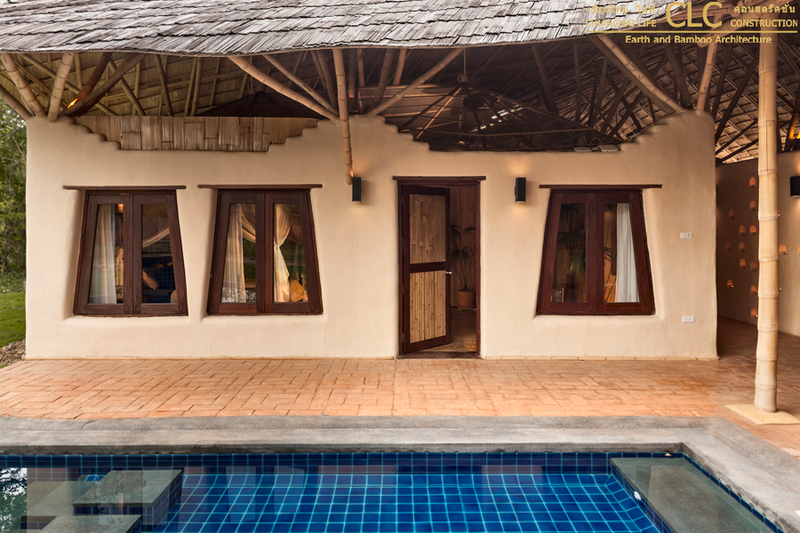 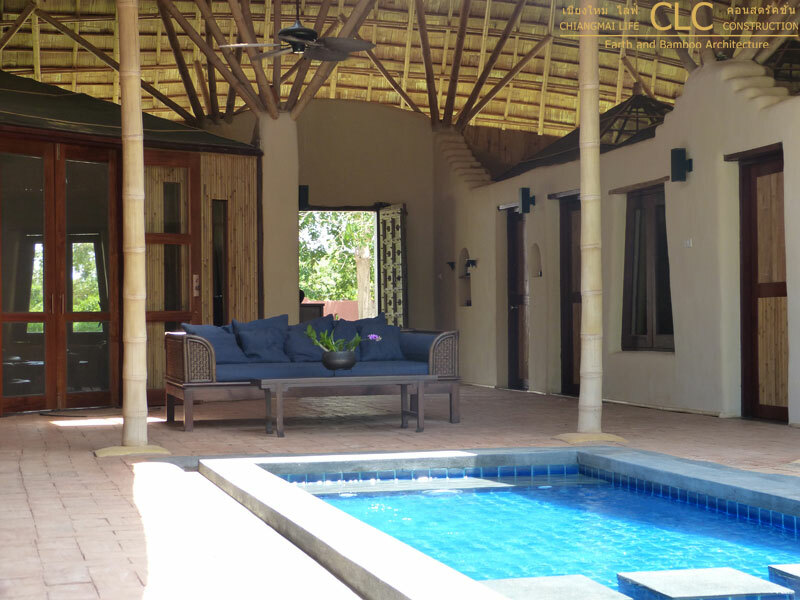 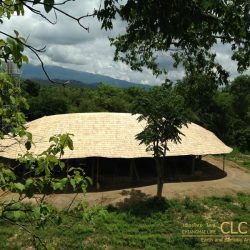 The Trika Villa estate also includes a bamboo Yoga sala which is made in a different style of bamboo architecture – with bundled bamboo arches. 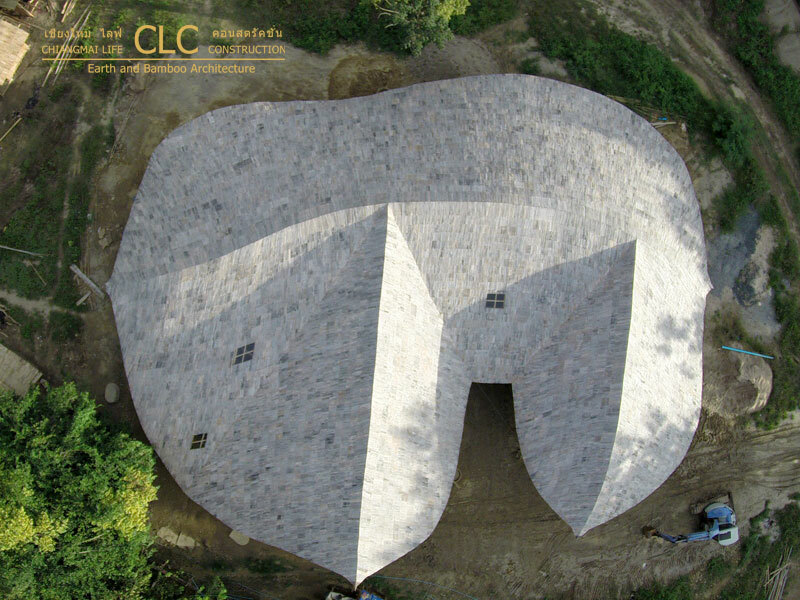 For an aerial video of the construction click here.